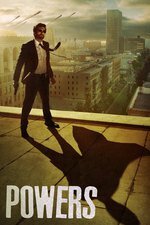 As a lethal powers-enhancing drug is unleashed on the public, Detectives Walker (Sharlto Copley) and Pilgrim (Susan Heyward) seek out the criminal mastermind behind it with the help of iconic Power, Retro Girl (Michelle Forbes). As clues come to light, Walker considers the possibility that Wolfe (Eddie Izzard), his dangerous former mentor turned nemesis, might have the answers he seeks. Series is steadily improving. Deena Pilgrim is getting more and more bitchy which is AS IT SHOULD BE. I enjoyed the scene in the talent agency immensely, especially the cringing flunky offering a glass of water.